The week before I went to the International Food Blogger Conference (IFBC) in New Orleans, I had some serious cravings for Cajun and Creole food. I had gumbo, jambalaya, and pralines on the brain and needed to take care of that situation. 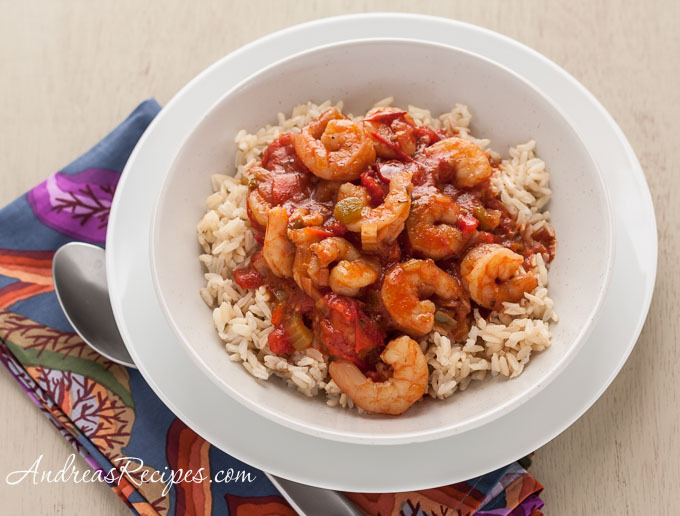 Since the kitchen counters were overrun with ripe tomatoes and more were hanging out in the garden waiting to be picked, it had to be a recipe that called for lots of tomatoes, and this shrimp creole was it. The flavors are so good that even my pickiest eaters all had second helpings. It went fast. The ingredients are all widely available and in terms of cooking techniques, it’s pretty simple. If you’ve never made a roux, this is a good recipe to learn with because it calls for a golden roux, which doesn’t take as long as a dark roux, and it’s not a huge batch, so if something goes wrong and the roux burns, you won’t lose a bunch of ingredients. If you’re out of fresh tomatoes, you can substitute a 28-ounce can plus a 14-ounce can of diced tomatoes. The recipe is adapted from Recipes from a Kitchen Garden, one of two cookbooks from Renee Shepherd, the immensely talented and knowledgeable owner of Renee’s Garden. I bought both of her cookbooks because they have so many great recipes for homegrown produce, and all the recipes are organized by the main vegetable or herb. If you have a vegetable and herb garden, I highly recommend Shepherd’s books. And in the meantime, enjoy a little taste of New Orleans. Adapted from Recipes From A Kitchen Garden, by Renee Shepherd & Fran Ruboff. 1. In the Dutch oven, melt the butter with 1 tablespoon of the canola oil over medium heat. Add the flour and whisk until the flour turns golden brown and has a nutty taste, about 10 minutes. Transfer the flour mixture to a bowl and set aside. 2. Heat the remaining canola oil in the Dutch oven and add the onions, celery, peppers, and garlic. Sauté until they are softened, about 3 to 5 minutes. Return the flour mixture to the pot. 3. Add the tomatoes, tomato sauce, thyme, bay leaf, black pepper, red pepper flakes, hot sauce, brown sugar, and chicken stock. Stir and bring it all to a boil. Reduce heat and cook covered at a simmer for about 30 to 40 minutes. Season with salt and cayenne pepper to taste, then remove the bay leaf. 4. Add the shrimp and cook until just pink, about 2 to 3 minutes. Serve immediately in bowls over rice, and garnish with the chopped parsley. Oh, yes, this is my kind of food. The ingredients are similar to jambalaya, my “signature” dish, so I always have most everything on hand. Thanks so much for linking to my gumbo ya-ya. I believe I could eat New Orleans dishes every day. This looks stunningly delicious and im pretty sure i have evvverrythiinng needed 🙂 gorgeous! This looks and sounds like a wonderful recipe. I’ve been eyeing a shrimp & grits recipe for about a week and think I may try this on instead. Your site is looking so gorgeous! Love all the clean lines and organization. Just fabulous. That looks good! Hi Andrea, can’t believe I have not been visiting your blog. The food look delicious as always.